Change is good. Say it three or four times. Change is good. Keeps your brain active. Sooooo…. 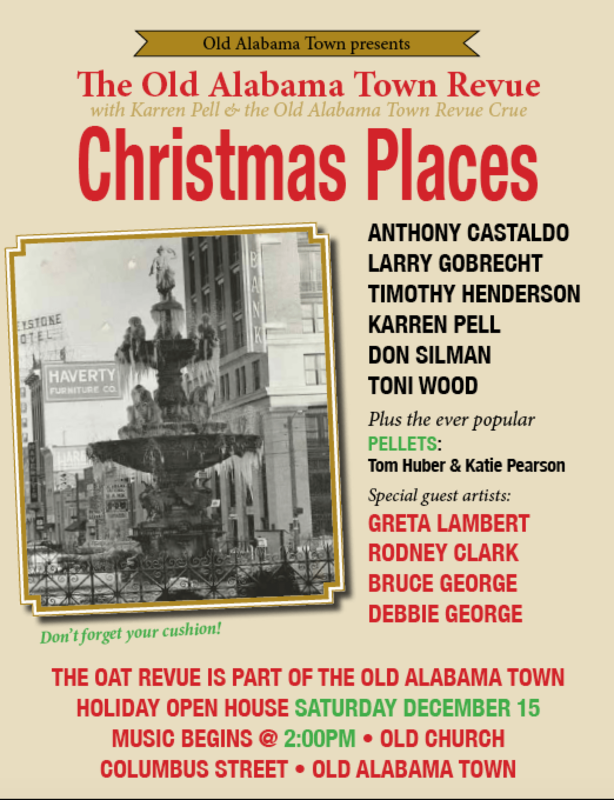 This year the Old Alabama Town Revue’s Christmas show will be part of the Old Alabama Town Holiday Open House. Therefore, the show will be on Saturday, December 15 at 2 p.m. The Old Alabama Town Holiday Open House, on Saturday December 15, starts at 9:00 in the morning and closes at 4:00 in the afternoon. For the Holiday Open House, enter through Lucas Tavern at 310 North Hull St.; admission is free with a can of food to be donated to the area food bank. Admire the nineteenth century buildings decorated like they were in their day. Help yourself to cookies and warm cider and enjoy watching traditional holiday craft making, costumed villagers, and hearing stories of Christmas Past. At 2:00 the Old Alabama Town Revue begins. If you are already attending the open house, just meander around to the church and come on in. If you are just planning on coming to the Revue, then you may enter through the small gate on Columbus Street. (Keep repeating, “Change is goodchangeisgood..). As always, the Revue is free and open to the public. We have a special show for you. The Crue will be decked out in Christmas finery. Now that will be a sight. For our theme, “Christmas Places,” we will sing original songs and old faves. Toni and guest artist Bruce George will present a duet of “I’ll be Home for Christmas.” Toni will also sing a duet of “Silver Bells” with Larry Gobrecht. Tim will render everyone’s favorite, “Santa’s Super Sleigh,” and yours truly will tell about my neighborhood, historic Capitol Heights, with the song “Rockin Holiday.” Debbie George is gonna show up in red cowboy boots and rock us all out with “Rocking Around the Christmas Tree.” The Pellets are gonna croon, and ringaling ling!! Tony on drums (rummy tum tum) and Don on bass (thumpy thump thump) will keep us on the beat and in the groove. But there’s more: Fabulous Greta Lambert and Amazing Rodney Clark are also guest artists for the show. Wow! It doesn’t get better than that. So come celebrate the season with the Old Alabama Town Revue. Come early and enjoy the Old Alabama Town Holiday Open House or come at 2:00 for the Revue. If you come early for the Holiday Open House, enter through Lucas Tavern on North Hull St; if you come for just the Revue, enter through the small gate on Columbus Street. Got that? So some things have changed, but a couple of things have not: First, we are going to have an amazing time and want you to join us. Second, nothing is different about those pews, so don’t forget your cushion!